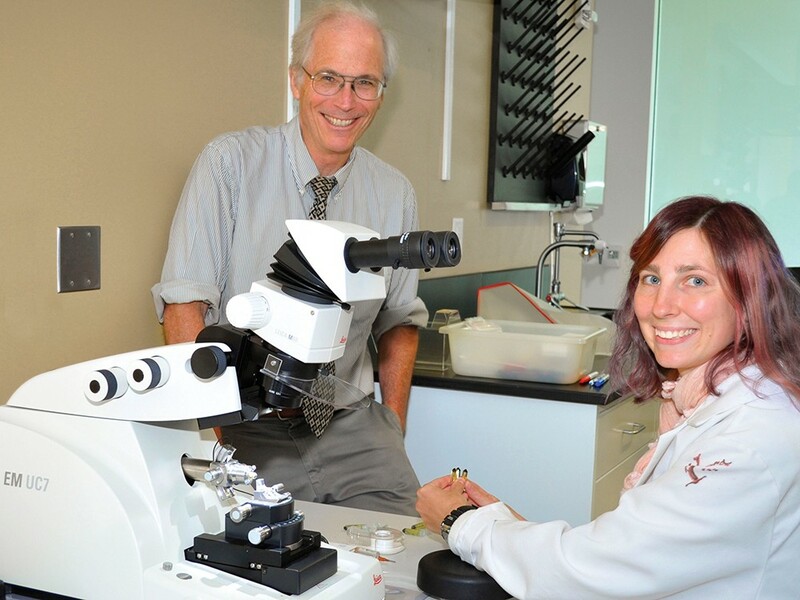 Innovation: The tricky fight against "orphan diseases"
Pharmacy Professor Mike Gibson with Dr. Kara Vogel, who did foundational work for the research grant. Mike Gibson has studied a rare genetic disease since 1980. Last April, his research took an important step forward. Gibson, a professor in the pharmacotherapy department, and his team of researchers at Washington State University's College of Pharmacy secured a four-year, $1.58 million grant from the National Eye Institute to study a drug that could eventually provide treatment for the rare disease he studies, as well as addiction and autism. He specializes in studying how to understand and treat rare genetic disorders, known as "orphan diseases." "And I mean rare," he says. "There are about 200 patients with this disorder published in the literature around the world. We think there are quite a few more, but it's a very rare condition." The disease, known as succinic semialdehyde dehydrogenase deficiency, or SSADH, is caused by a gene mutation that manifests differently in different people, but can cause difficulty with speech and movement, as well as severe epilepsy. Those symptoms are caused by the buildup of a neurotransmitter, gamma-Aminobutyric acid (GABA), which regulates messages between brain cells and quiets the activity of neurons. When GABA is out of balance, it's difficult for the brain to communicate properly with itself and with the rest of the body. There is currently no "targeted" treatment for the genetic disorder itself, Gibson says. Rather, doctors treat the symptoms. However, one drug used to treat the disease that has shown some benefit can also have a severe side-effect known as "night blindness." Patients could permanently lose some degree of their peripheral vision if they take the drug long enough, he says. That's where his research comes in. The grant will be used to conduct laboratory studies with a second drug that Gibson hopes will counteract that visual side effect. "It's a four-year grant, and I expect we will have a good, solid pile of data in the next year, and then we would hope to be planning human clinical trials," he says. "Those can be notoriously slow to develop, but I would like to think down the road about three to four years, max." Indirectly, he says, his research can have implications for autism and addiction treatment.